noun: 1. a technique of composing a work of art by pasting on a single surface various materials not normally associated with one another, as newspaper clippings, parts of photographs, theater tickets, and fragments of an envelope. Spoiler Alert: It's just paper and glue. Simple. Anyone can do it. Let's start with the book that started me on that glue and paint covered art journey. 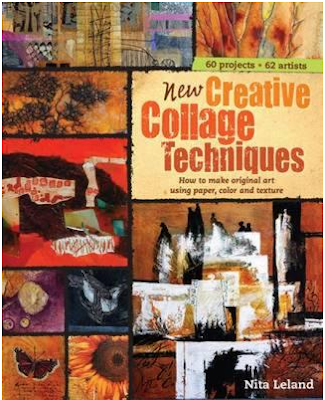 New Creative Collage Techniques by Nita Leland, is an updated and expanded version of the amazing inspiring original Creative Collage Techniques (my copy has dogged ears and more than a few glue stains). This book is an exciting gateway into Collage (it was for me), with step-by step instructions and demos to help you dive right in. A truly comprehensive guide, CCT covers all aspects of the collage process including working with found paper, magazines, newspapers and book pages. There are detailed tutorials on both encasing papers in a medium and creating a transfer film - essential skills for the serious Collagist. The information on supports for collage and how to prepare them, another essential, is beyond helpful. Projects include creating Landscapes and Portraits with paper as well as detailed design lessons on creating both realistic and abstract collage. Learn weaving, mosaic and even mixed media collage - how to successfully add colored pencil, watercolor and acrylic to collage. There are also projects incorporating photographs, distressing paper, adding texture and making your own papers to use in collage. If you only read one book on collage, this essential primer is it. But, there are loads of books on Collage out there, and each one takes a slightly different angle. Here are two divergent titles, one that leans in the crafty direction, the other in the more arty or fine art direction. 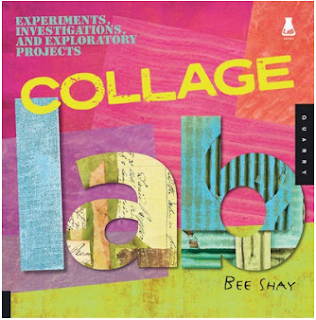 With a fun and crafty emphasis, Collage Lab by Bee Shay is a great book for someone wanting to dive into scrapbooking and collage. It feels like a real course in collage, covering many accessible methods. I like that it focuses on techniques without dictating a particular style or outcome. Each lesson has questions or concepts to ponder based on the techniques, and the author doesn't supply the answers, leaving conclusions open to the reader. Lab is the perfect word to describe the book because of it's focus on the reader doing the work and finding what works for them. A beginning collagist would gain lots of knowledge from this fun lab course. 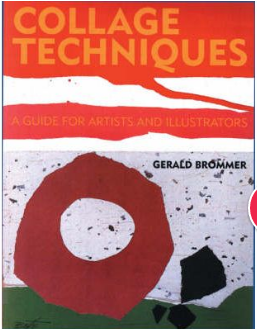 With a fine art sensibility, Collage Techniques by Gerald Brommer is a practical guide for anyone wanting to expand their art practice into collage. Using paper, photos, fabric and fibers in collage are discussed and demonstrated, including stepped-out photos of the process. The book covers the Elements of Design and ways to approach collage through still life, the natural environment, landscapes (including abstract landscapes), and the human figure. Full of diverse and inspiring completed projects, there are examples of collage as social commentary, the use of abstract and nonobjective imagery and adding 3D into collage. I hope you've been inspired to check out Collage. It's an accessible, endlessly creative and diverse form of creative expression, one that anyone, any age or level of skill or experience can participate in quite easily. All you need is glue, paper and a willingness to get a bit messy. Woot!